American playwright Eugene O’Neill, son of Irish immigrant actor James O’Neill and Mary Ellen Quinlan, lived a varied life pursuing two distinct careers, the second of which spawned his rich classics drawn from his first career at sea and from characters based on members of his immediate family. O’Neill’s “A Moon for the Misbegotten” is his last completed work, and premiered on stage in 1947. 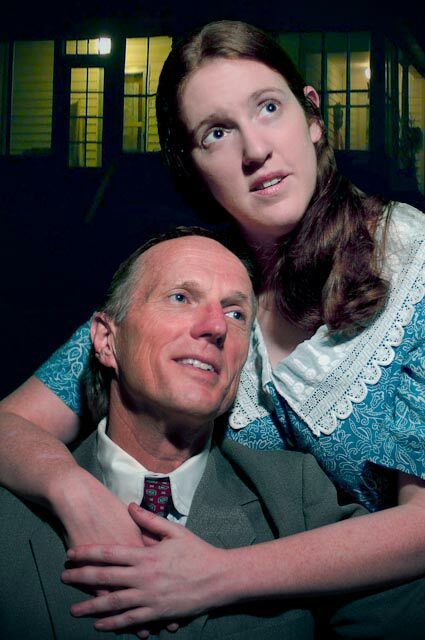 The Pear Avenue Theatre has mounted a new production of “A Moon for the Misbegotten”. The story is largely based on O’Neill’s older brother, incorporated into character James Tyrone, Jr., a man mourning the loss of his mother and a suitor for Josie Hogan, the daughter of Phil Hogan. The Hogans are Irish immigrants and live on the farm Tyrone owns. Tyrone has long admired Josie, but he has lived a life of debauchery as a washed up Broadway actor chasing showgirls and drinking himself into oblivion. Hogan also has three sons, the youngest of whom, Mike Hogan, is the last of the boys to leave – all too soft to endure their father’s abuse. Phil Hogan is a schemer, and Josie is like minded, helping him both with his gambits and with maintaining the farm. Josie is a hulk of a woman – strong, quick-witted, and sharp-tongued like her father. The remaining character is the Hogans’ neighbor, T. Stedman Harder, a wealthy land owner who objects to Hogan’s game playing and wants to buy the farm from Tyrone to push Hogan out. The play is written in four acts covering less than 24 hours of time in 1922. It is performed with an intermission between Acts 2 and 3 though the program lists just two Acts with an intermission in the middle. O’Neill has written numerous lengthy monologues to navigate, the Hogans speaking in Irish dialect which proves a bit difficult at times. Director Jeanie K. Smith has long admired O’Neill’s work, first reading “Moon” as a teenager, drawn to the romanticism in it along with its exploration of the human spirit. In this production, her small cast of four includes John Baldwin as Phil Hogan; Kurt Gravenhorst as James Tyrone, Jr.; Susannah Greenwood as Josie Hogan; and Michael Rhone in a dual role as Mike Hogan and T. Stedman Harder. On opening night, not yet completely comfortable with the flow and voluminous line load incorporating awkward period phrasing, the actors read as though they were a bit shell shocked at times. Their preview performance the night before ended after intermission because of a fire and widespread power outage when a nearby transformer blew out. As a result, opening night was the first full performance in front of an audience. Baldwin, playing the elder Hogan, has the lightest accent which is incongruous, but his demeanor is believable most of the time. Even his missteps make a certain amount of sense given his character’s drunken state. Greenwood adopts a heavy Irish brogue, but at times drops it for a few words or a line. While enthusiastic, she’s often too wooden in manner and too monotone and rapid-fire in speech losing much of the musicality and modulation one with a brogue would normally exhibit. Rhone has the most consistent accent and tempo, but then he also has the fewest lines, even playing two roles – Hogan accented, Harder not. The more humorous moments come through well, and on opening night, the audience reaction was quite favorable overall. Smith’s staging works for the most part, although later in Act 3 when Gravenhorst’s and Greenwood’s characters show each other their true feelings while delivering their soliloquies, the staging falls a little flat and the play drags. Each spends too much time staring off into the distance, not connecting to one another, though Gravenhorst injects credible emotion into portions of his character’s catharsis. When interacting directly, their physicality is more believable, if somewhat guarded. Gravenhorst’s character’s drunken mumbling is sometimes unintelligible, and while it fits the character’s physical state at the time, it almost buries a small portion of Tyrone’s story. Greenwood and Baldwin have some nice moments together, particularly when first developing and executing their schemes, then later when the truth is finally revealed and Josie’s and Hogan’s trust and mutual admiration come through. Rhone, while only in two scenes, one as each character, gives a strong performance. His smooth delivery and his interactions with Greenwood are particularly nice as they spar as siblings early in Act 1. Jeanie K. Smith and Gordon Smith provide a nice touch with modern Irish music in the background before the show, during Act changes and intermission, and after the show setting an appropriately melancholy mood. John Bernard’s lighting couldn’t be fully appreciated on opening night due to a blown circuit from the preview night’s power failure that unfortunately removed the subtlety and the sunrise. That should be corrected before the weekend is out. Ron Gasparinetti’s unit set serves the play well with action utilizing the entire stage inside the Hogans’ house with its kitchen and bedroom, along with the porch and front yard. In the yard, decorative boulders circle the house, each with “shaved bark” (actually shaved tire rubber) surrounding them. Downstage right, is a “working” well with a water pump, and a clothesline is strung from the house to a tree upstage right. The set provides the right period tone. Slightly amusing, the glow tape on the stairs and rocks on the set is needed for safety, but in blackouts, its prominent glow around the stage creates an almost modern holiday lighting effect. Though a bit ponderous at times, this production is worth seeing as it continues Thursdays through Sundays through 5 February 2012 at the Pear Avenue Theatre located at: 1220 Pear Avenue, Unit K, Mountain View, CA 94043. See http://www.thepear.org or call (650)254-1148 for tickets or more information. Good review. You cover all aspects of the production nicely with a little background of the play as well. I was at the opening performance too. I agree that there were some highs and a couple of dips but overall I would say that the cast was extremely strong. Susannah Greenwood carried the play beautifully and John Baldwin’s character was wonderful. The accent issue is tricky because I don’t think that it’s clear whether any of the characters were born in Ireland. I would have to read the play. O’Neill usually gives pretty detailed instructions.